Auvik is the most efficient and profitable way for MSPs to manage network infrastructure. 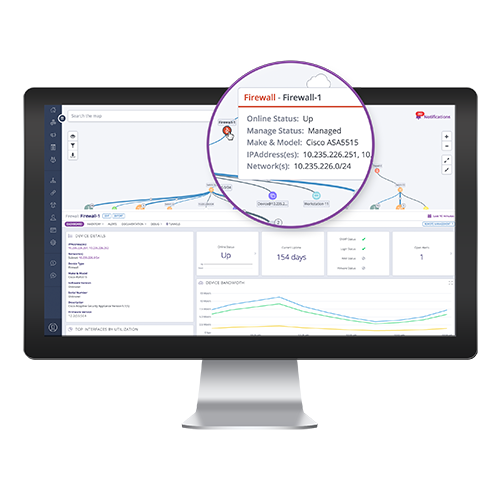 Use Auvik’s network infrastructure RMM to complement your current server and endpoint management. Deliver fully on client expectations by actively managing network infrastructure, in addition to servers and endpoints. Build out existing service capabilities with smooth integration to remote monitoring and management (RMM) tools you already use. Rocket your team’s efficiency by automating time-consuming network infrastructure management tasks. Manually managing network infrastructure isn’t efficient. Not managing it at all is a risk. Routers, switches, firewalls and other packet pushers form the very heart of a network and troubles in those areas can quickly bring a whole business down. 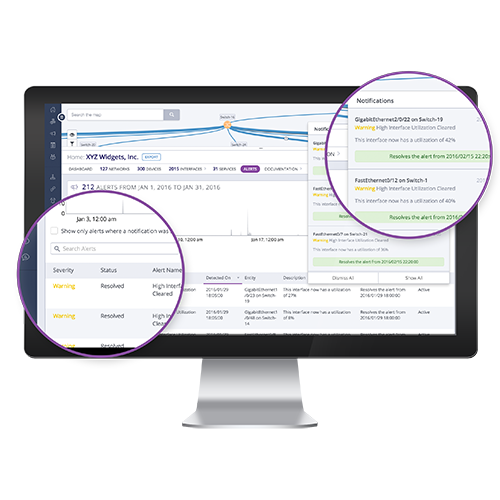 Auvik gives you the visibility and efficiency you need to manage that infrastructure—profitably. Requirements: Integration with Auvik works with both ConnectWise Cloud or ConnectWise On Premise. Auvik alerts automatically create tickets in ConnectWise Manage. When the ticket closes in ConnectWise Manage, that information is pushed back to Auvik to automatically dismiss the alert. You can map Auvik alert severities to your ConnectWise Manage priorities. Auvik can send an inventory of network devices and configurations to ConnectWise Manage. Information such as device names, serial numbers, MAC addresses, and IPs are kept up to date—automatically. This helps improve your view of the network and dramatically reduces time spent on manual documentation. 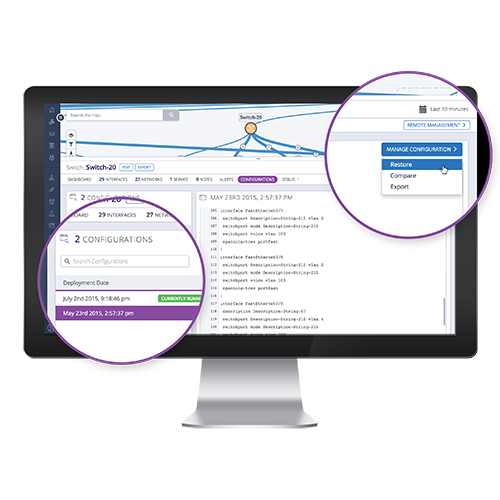 The Auvik audit trail shows you a history of all communications (inbound and outbound, successful and failed) that have occurred between Auvik and ConnectWise Manage. Detail listed in the audit trail table is based on your selected date range. Very useful for troubleshooting! Requirements: Integration with Auvik requires ConnectWise Automate v10.5 or higher. See Auvik's real-time network maps in ConnectWise Automate. Increased network visibility helps you close tickets faster. See Auvik dashboards in ConnectWise Automate. Collect everything you need to know about a client's network in one spot. Access Auvik MSP administration functions in ConnectWise Automate. 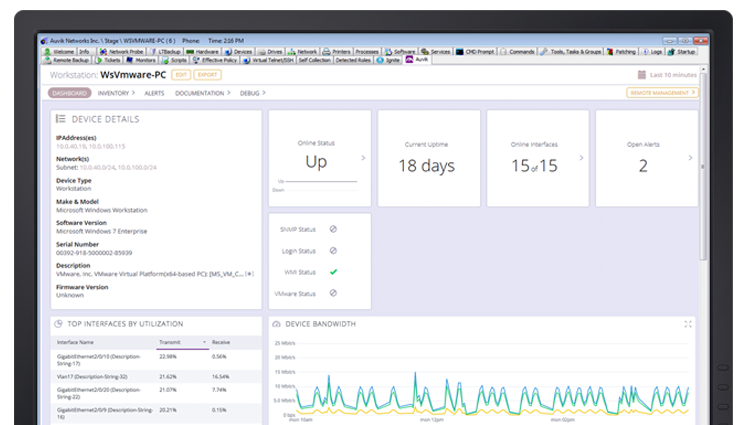 These include clients, discovery settings (OID monitor, health check frequencies, discovery services), integrations, manage users, manage alerts, and shared appliances. Makes managing your client’s network infrastructure fast and efficient. Auvik's ConnectWise Manage Integration is certified via the ConnectWise Invent Program. Our goal is to respond quickly to all tickets, but sometimes things get busy. Please allow up to 24 hours for a reply during regular business hours of 8:30 a.m. - 5:30 p.m. ET, excluding weekends and holidays. Please DON'T submit multiple tickets for the same issue—this will keep multiple support reps from bothering you about the same thing. Make sure emails from Auvik support don’t get lost: Add our email address (support@auvik.com) to your safe senders list. Auvik's ConnectWise Automate Plugin is certified via the ConnectWise Invent Program. We have been using Auvik for a while now and could not live without it. It is an invaluable tool in our toolbox. From issue mitigation to router configuration, it helps us do it all. It is great for multi site clients to keep an eye on VPN status and bandwidth utilization. We utilize Auvik for Alerting/Monitoring of Networking Devices, assisting in the onboarding process by documenting discovered networking devices into our documentation platform and giving a live visual insight to the networks we manage. It has a been a wonderful tool. Auvik Support is Top Shelf! We started using Auvik a few months ago and it has already saved us many hours of troubleshooting. Particularly in large environments with a lot of L2/L3 equipment, it can be an absolute lifesaver. Having immediate visibility into "whats plugged in where" across an environment with 35 switches, 30 Access Points and 10 routers has ended the days of wild goose hunting or relying on complex documentation to keep track of where everything is connected. Highly recommended! The alerting that this system gives is pretty amazing! It is very informative and very quick ! We are in love with this software! Auvik has been a great addition to my connectwise suite, It really helps with knowing about internet outages well before a user even picks up the phone and calls us. I highly recommend auvik to anyone that wants something like solar winds without paying the insane price of solar winds. We have been using Auvik for several years. It has been a great addition to our suite of tools. It does for network devices what Labtech has done for PC's and servers. It is a very powerful product,we are still learning how to tune it and make it even more useful. Their support has also been very good, they have been able to solve any problem we have had and when are just trying to figure out how to monitor or alert on something they have always found a way to make it happen. 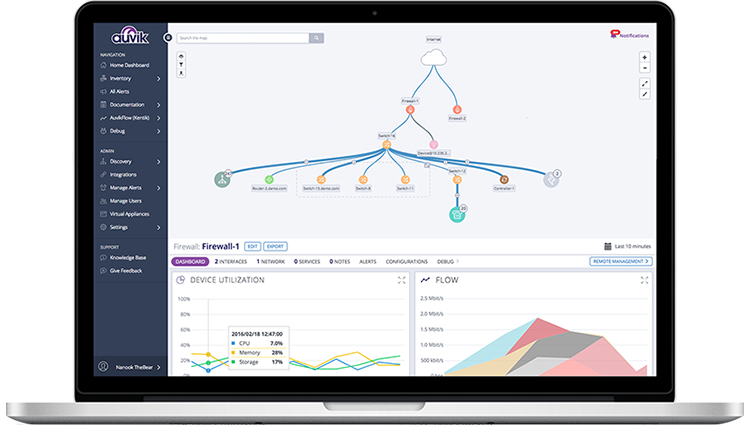 Auvik is a great network tool that gives you the ability to have a visual representation of a client's network in real time that you can interact with. It does take a little bit of tweaking to get it setup and going but once you've got devices edited, login credentials, SNMP and WMI enabled you get a plethora of really essential network information! We've been able to pinpoint bandwidth hogs, dead or dying ports on switches and uncover devices we never even knew existed! We first bought Auvik to use for simple network topology and address management. But it has become a much more useful tool as we continue to use it. The ease of documentation, troubleshooting and device management has made our lives much easier. Not only are we able to monitor our networks with ease we can also visually see them. Auvik is continually working and updating the service to improve on an already great product. Jeff Hauser, Innovative Integration, Inc.
Auvik is a wonderful tool to help us monitor and manage our MSP clients infrastructure. There are so many features and tools, that it is better than a Swiss Army knife for IT. Not only can you set monitoring and alerts, but you have the management tools to help you get connected to the errant node. I have used many other products similar to Auvik, but this is the best for price, performance and range of tools available. An amazing product. We have discovered network devices at clients we were not aware of as well as failing components of critical network devices. It does have some minor glitches, but all-in-all this is a great tool and highly recommended. Originally we got Auvik in order to assist with company onboarding. After working with it for a few months now, I can honestly say that it's a pretty night and day experience. In the past we'd just been doing a lot of manual exploration as we brought customers on; now we deploy Auvik and all the relevant information we need is right there. It's especially handy in messier environments with communication across multiple network segments. Highly recommend this tool! Auvik has proven to be a valuable tool in supporting our clients and resolving network traffic issues. The support and training is thorough and comprehensive. We originally Looked into Auvik to compliment our RMM tool to see all devices. It has become a viable asset in our tools used to manage our clients. Has increased our efficiency making us aware of issues and alerting us instantly. Its helped us be more pro-active instead of re-active. Has also helped us in our documentation especially Visio diagrams since it maps out everything that is on the network. It's now a requirement for any new client we on-board. Auvik integrates nicely into the wheelhouse of tools used to assist our clients. It is important that systems work well together. Auvik fills in the gap to provide monitoring and support for network devices that other tools miss the mark on. It is catching alerts for items we were missing in the past. Looking forward to their continued growth and development. Auvik has been a big winner for us. We monitored network usage before in different ways but it usually ended up being a million different tools and never the full picture we were looking for. Auvik gives us the inside information we've always wanted and integrates with our favorite tools to send us alerts and create tickets. Would HIGHLY recommend. You'll be surprised at the network bottlenecks you had no idea about once this starts pumping out alerts. Excellent. Really great software to have installed when you are troubleshooting. Monitoring really fills that gap left by Automates lack of SNMP. Huge value from the way licensing is setup regarding monitoring workstations/servers on top of the network devices. Alex and his support team are really great and responsive. We've been using Auvik for a few months. It's value, especially during problem mitigation, is invaluable. Without Auvik, we would have spent significantly more time troubleshooting a variety of issues. For example, one of our clients reported slow network performance. Auvik helped us to remotely identify that they had installed a slow unmanaged switch (100Mbps). Without Auvik, we would have likely needed a site visit. With it, we identified the problem and had a resolution in short order. Dean Osborne, Business Computer Solutions Ltd. The 2 way Integration with ConnectWise Manage is excellent so any issues are flagged but self heal when resolved. The Integration to ConnectWise Automate is such a vital tool as helps track down any network issues so quickly. Joey Undis, Techgen Consulting, Inc.
We subscribed to Auvik earlier this year to gain a better view of some of our most complicated client networks. It has been a huge boon to troubleshooting network issues at clients where you have no idea where a user may be or if they're plugged into a phone, unmanaged switch, or just wireless. The automatic device config backup and remote web browser are pretty cool as well. It is quite pricy though for what it provides, so it's not for every company. Luis Alvarez, Alvarez Technology Group, Inc.
We got Auvik originally to augment CW Automate so we could better manage non-Windows devices. After using it for about four months, I can tell you it is one of the most powerful tools in our management suite, not only because of all of the features built into it, but also because it is a great documentation tool. When you deploy it during onboarding or discovery, it will literally tell you what you don't know and what you need to find out: passwords, snmp strings, etc. It's indispensable!